Discussion in 'Faucets' started by mycrypto, Nov 8, 2018. Btcclicking---- No ads- no hidden miner! 20-25 satoshi every 0 min! 110-1000 satoshi Every Hour with just one short link! Convert them to BTC and withdraw! Roll Game: Every 60 minutes 10 - 100000 satoshi! 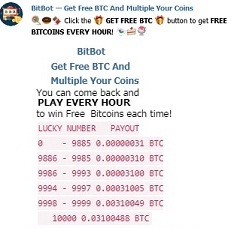 Every day you will receive free lottery tickets. Each ticket gives you a chance to win up to 1 BTC! Hire digital cats & Get BTC. FREE cat earns 600 sat. per day. Looks there is no any 'pay out points' requirement here.